It is with great pleasure that the independent transport videos cameras have been invited back to record the 2016 event organised by the North West Vehicle Restoration Trust. Each year the event is centred on the Trust’s premises on the Kirkby Industrial Estate near Liverpool, Merseyside. We start our filming early in the morning as the vehicles are positioned and visiting vehicles arrive for the day’s action. 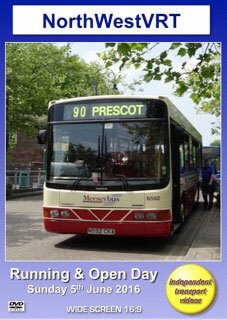 There are always a large variety of buses and coaches for you to see and enjoy. As before companies represented include SELNEC, GMT, Crosville, Birkenhead Corporation, Liverpool Corporation, MPTE, Merseybus, St Helens Corporation, North Western, Arriva, Stagecoach and many, many more! This year Stagecoach supplied a brand new ADL Enviro 400MMC double decker for Merseyside and a brand new ADL Enviro 200MMC single decker bound for the Chester Park & Ride services, that had only just been delivered from the Falkirk factory some 12 hours before its arrival at Kirkby! There is plenty of action for you to see as these buses come and go along Charleywood Road adjacent to the NWVRT premises. The “Big Launch 2016” took place at 12.30. Our cameras were given exclusive access behind the scenes to see the ‘launch’ vehicles being prepared prior to being revealed to the eager awaiting public! As you will see our cameras joined some of these vehicles to sample their rides. Our first journey out is on board ‘launch’ vehicle 6952 (N592 CKA) a Volvo B10B-58 with Wright Endurance B49F body in the livery of Merseybus. We journey to Prescot accompanied by 21116 (W465 CRN) a Volvo B10BLR with Wright Renown bodywork in the livery of Stagecoach Merseyside & South Lancs, also a ‘launch’ vehicle. This bus was donated to the Trust by Stagecoach, and has been restored by the Kirkby team to the very smart condition seen on our programme. From the bus station at Prescot we return on 21116 for comparison. Our next ride out is on board a very unique bus. 7250 (TUB 250R) is a Foden-NC, with Northern Counties H74F bodywork in the livery of West Yorkshire PTE. This bus was built in 1977 and has a Gardner engine and makes some very interesting noises as we journey around the industrial estate. Next up is a ride on former Merseybus, Leyland Atlantean AN68/1R. 1301 (DKC 301L) has an Alexander H75F body and has been restored to a very high standard. Our final ride of the day is on former Warrington Borough Transport 71 (LED 71P) a Bristol RESL6G with East Lancs bodywork. Also immaculately turned out, we travel around the industrial estate to enjoy the sound of the Bristol RE. Our cameras film some of the departures at the end of this superb day. We would like to thank the NWVRT for organising this excellent event and for inviting our cameras to film it.